On a Thursday exactly 10 years ago (2009), Mr. Wilhelmus Johannes Stiekema has been appointed Professor (gewoon hoogleraar) at the University of Amsterdam . On a Thursday exactly 21 years ago (1998), Mr. Carsten Karel Willem de Dreu has been appointed Professor (gewoon hoogleraar) at the University of Amsterdam (his complete profile). On a Tuesday exactly 23 years ago (1996), Mr. Wouter Jacques van Bekkum has been appointed Professor (bijzonder hoogleraar) at the University of Amsterdam . On a Friday exactly 48 years ago (1971), Mr. Arend Johan Nijk has been appointed Professor (gewoon hoogleraar) at the University of Amsterdam . On a Thursday exactly 49 years ago (1970), Mr. Gerard Barendrecht has been appointed Professor (gewoon hoogleraar) at the University of Amsterdam . On a Wednesday exactly 50 years ago (1969), Mr. Robert Frederik van Naerssen has been appointed Professor (lector) at the University of Amsterdam . With uva-view.nl you can explore metadata of publications by the University of Amsterdam for the years 2000 upto 2017. The data in uva-view is based on metadata of publications by the University of Amsterdam. This metadata is normalized and standardized at a higher level than 'normal' references to publications (publication metadata is most kwown as references). In uva-view you will not find complete reference lists of an author or institute. However you will find a neat representation and optimal linked overview of the 'meta' metadata. It is possible to take various starting points (i.e. author, journal, institution) and different ways of viewing the data. Various sources are used and linked: Metis (the university CRIS), Scholary Stats, journal evaluation data (2010), Worldcat, Web of Science, Narcis, Google Scholar, Researchgate etc. ... realise science is not number of publications, citations and all kind of indexes. Science is to collaborate, discover and share. We hope uva-view.nl will help to discover the research landscape of the University of Amsterdam. 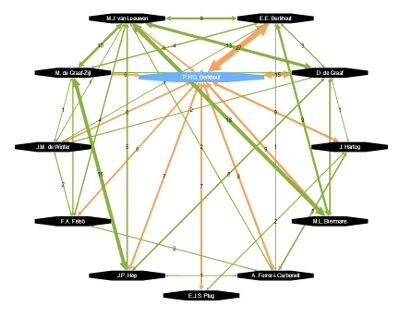 Use uva-view to find relations among scientists, journals, institutes and so on. www.uva-view.nl is not developed to evaluate researchers and not suitable for it either. uva-view.nl tries to give an overview of scientific activities of the UvA-scientists. If you notice some omssions, suspect errors or want to let us know anything else: please e-mail us. uva-view.nl shows just a glance of the data avialable, the database 'behind' uva-view may be of use for additional questions you may have. Your ip number (3.95.63.218) is outside of the UvA ip range.